Ok, so I have never done a mommy and me session with anybody other than my self and my children, who are all over the age 5. It is quite different to do a Mommy & Me session with a child who is under one. A fussy little one who was more interested in what was going on outside the studio windows than what we were doing in the studio with the camera. But that’s ok, Mom was looking stunning and together we made the session work. 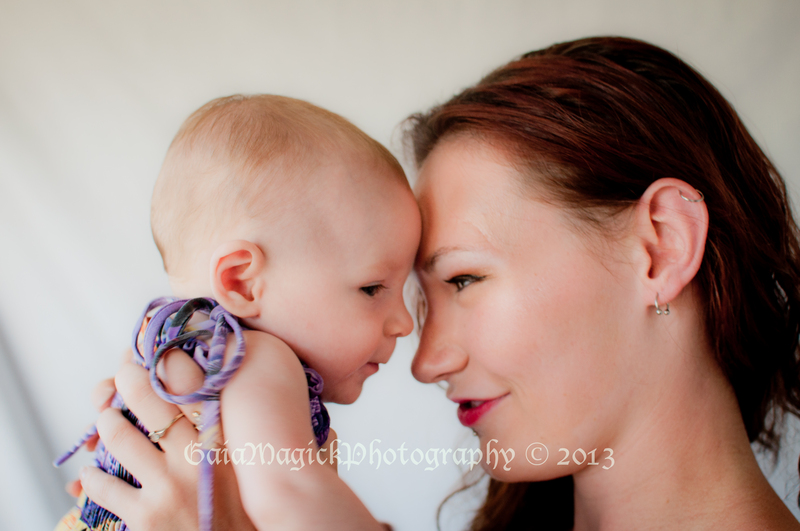 I tried to get images of Coral and her daughter Aria that they could both look back on and enjoy, and also images that captured their bond at this point in their lives and, of course, the personality of little Aria at this stage in her life. I managed some really great images of them being cute together, of mother loving child, and of them being silly and laughing. And I got some great baby faces! Compared to children, especially the young wee ones, photographing shy naked ladies is a piece of cake! I love my job, and don’t mind the occasional deviation from my female empowering photography sessions. The sessions I get to do with little children keep me passionate about what I do, excise my skills as both a mother and a photographer, and remind me why I’m not having any more babies of my own! If you liked these Mommy and Me glamour images and are interested in having your own bond with your child(ren) captured to be treasured for years to come contact me to book your own session. Hair and make up is included for mom, and I do have a pre-teen to keep your kids amused and out of your hair while you enjoy a little pampering before your session with your kids. To contact me to book or for more information call 250-792-0868 or email gaiamagickphotography@hotmail.com. Stay Gorgeous!